FCA Australia has today confirmed local pricing for the all new Alfa Romeo 4C Spider, with the stunning Italian supercar due to arrive Down Under in November 2015. With the exhilarating Alfa Romeo 4C having already launched to rave reviews from media and customers alike, FCA is thrilled to announce the open-top 4C Spider will join its hard-topped sibling in Australia for an MSRP of just $99,000. Adding to the Alfa Romeo brand’s legendary racing history and the exciting experience of open-air motoring, the Alfa Romeo 4C Spider debuts with panoramic views complemented with a signature Alfa exhaust note, plus the essential sportiness of the award-winning 4C. 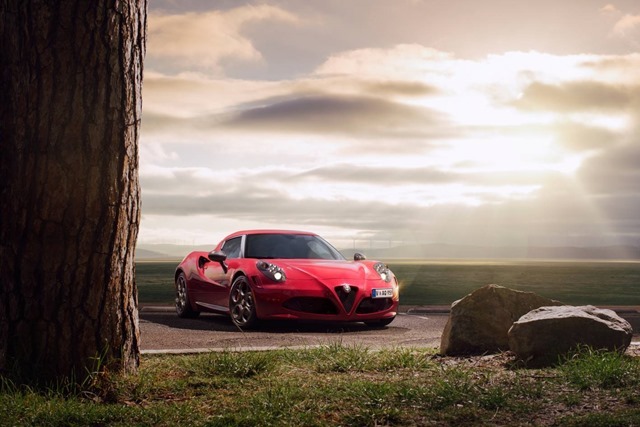 The Alfa Romeo 4C Spider name recalls the brand’s great sporting tradition. The acronyms 8C and 6C in the 1930s and 1940s distinguished racing and road cars fitted with powerful eight- and six-cylinder engines. Like the award-winning 4C Coupé, the new Alfa Romeo 4C Spider model’s designation is a return to “the great Alfa Romeos” and continues this tradition with the innovative all-aluminum 1750 turbocharged, intercooled, direct injection, four-cylinder engine, delivering an impressive 101 kilowatts per litre. Inspired by the 33 Stradale, the all-new Alfa Romeo 4C Spider transcends this legendary racecar’s mid-engine body and follows its purposeful and lightweight performance tradition with sheet-molded compound (SMC) composite panels forming its seductive Italian design, and “clothing” its state-of-the-art carbon fibre monocoque chassis and all-aluminum 1750 turbocharged, direct-injected engine. Covering the “beating heart” of this Italian supercar is a deck lid with three functional heat extractors and an aerodynamically tuned spoiler. Two muscular forms straddle the rear hood and elevate the body above the cockpit’s beltline for visual strength and foundation for the black “halo”. The rear fascia and round rear LED illuminated tail lamps blend into the muscular rear wings for a powerful stance, while stylistically incorporating large functional air intakes to cool the engine. Below, dual exhausts are mounted at the corners and highlight the 4C Spider’s supercar stance. On each side of the all-new 4C Spider, the sculpted air intakes spring a muscular and dynamic form that lead elegantly into the headlamps. Highlighting its exotic monocoque is a carbon fiber windshield frame, which promotes strength and lightness, while providing the attachment points for the removable, stowable cloth roof. 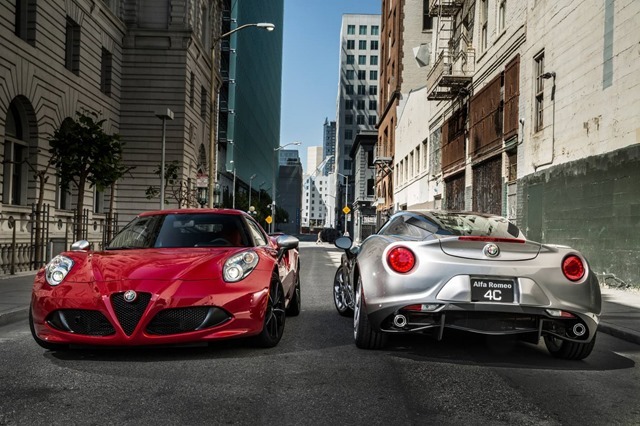 Leading from the 4C Spider’s windshield and down the hood are two muscular hood forms, which naturally conclude at the signature Alfa Romeo shield-shaped grille and emblem. Together with the two side air intakes designed in the front fascia, the 4C Spider forms the famous “Trilobo” within which the iconic logo is placed – and a significant facet of Alfa Romeo’s distinctive design. The all-new Alfa Romeo 4C Spider’s cockpit is inspired from racing; purpose built with only the essential driving components stylistically integrated. The Alfa Romeo 4C Spider features two composite-framed sport seats with standard leather and an exposed carbon fibre monocoque that exemplifies its race-inspired technologies. Furthermore, a driver-oriented cockpit with flat-bottom, leather performance steering wheel with paddle-shifters and aluminium pedals speak to the brand’s racing spirit. For an added touch of exclusivity and technology, carbon fiber trim is available as part of a new Carbon Fiber Package. Highlighting the use of advanced technology is a 7-inch full-color driver information display (DID) cluster, which displays vehicle information through high-impact graphics to keep the driver focused on the road, or track, ahead. Thanks to its mid-engine layout, advanced technology and compact size, the all-new Alfa Romeo 4C Spider demonstrates its precision, agility and performance credentials with a top speed of 256 kph, 0-to-100 km/h in 4.5 seconds, 1.1 g of lateral acceleration and 1.25 g of maximum braking deceleration. 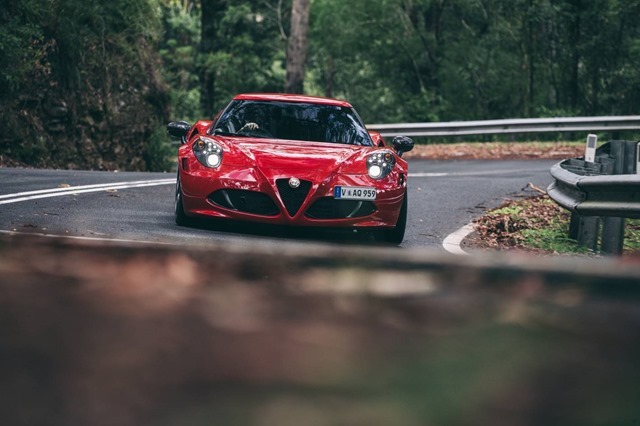 Delivering the ultra-lightweight architecture needed for maximum performance and dynamic efficiency, Alfa Romeo engineers looked to Formula 1 and only the most advanced supercars for state-of-the-art materials. The result is a monocoque chassis made entirely of unidirectional, “pre-preg” carbon fiber layers that are hand-laid for extraordinary stiffness and strength. At 73kg, the highly exotic carbon fiber monocoque chassis delivers a material performance that is three-times stronger and seven-times lighter than steel. Completing the competition-grade architecture are front- and rear-chassis structures and an engine-mounting frame made from lightweight aluminum. Thanks to the monocoque’s inherent rigidity, Alfa Romeo engineers were able to minimise structural differences between the 4C Spider and 4C, resulting in a weight of only 1035kg– an increase of only 10kg over the 4C. For a technical look, header strength and low center of gravity, the 4C Spider features a unidirectional carbon fiber windshield frame that is adhered and bolted to the monocoque chassis. In addition, a specially contoured aluminum roll bar (underneath the Black “halo”) provides mounting points for the new rear deck lid, while unique upper body brackets and a high-strength steel engine compartment cross beam maximise torsional rigidity. Alfa Romeo engineers continued the use of state-of-the-art materials by creating the bodywork entirely of sheet-molded compound (SMC), a low-density, high-strength composite material that is 20 percent lighter and dimensionally more rigid than steel. 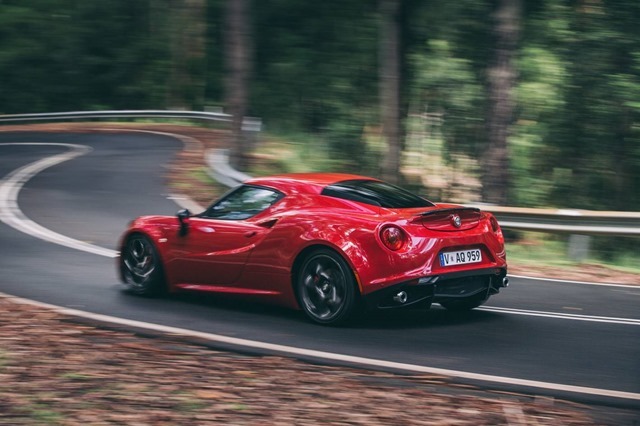 Engineers even optimized the Alfa Romeo 4C Spider’s windshield and side windows by using 10 percent thinner glass to reduce weight by up to 15 percent. Finally, two sport seats feature a carbon fibre and fibreglass reinforced-composite structure to deliver the strength and seating position needed for performance driving. The new ‘4 cylinder’ 1750 Turbo Petrol with direct injection at 200 bar delivers maximum power of 240 HP (177 kW) at 6,000 rpm. The maximum torque of 350 Nm ensures its extraordinary elasticity and sportiness since it is maintained constant between 2,200 and 4,250 rpm, but 80% of the torque is already available at just 1,800 rpm. The Alfa TCT gearbox has been optimised for the Alfa Romeo supercar. The Alfa Romeo 4C Spider’s special clutch features all-new control software that ensures the fastest possible gear shifts under all conditions. Gearshifts are more aggressive in the sporting performance modes, and drivers can clearly feel the new gear engaging, as on a racing car. On bends, on the other hand, gearshifts are completed in the smoothest way possible to avoid reducing stability. The Alfa Romeo 4C Spider’s is also fitted with Launch Control for easy high performance standing starts. Launch Control is activated by pressing the brake pedal while pushing the accelerator pedal all the way down and squeezing the paddle on the left of the steering wheel. As soon as you release the brake, the system automatically controls the gearbox, traction and power to maximise acceleration. The suspension adopts race-derived technical solutions to optimise performance and deliver unrivalled driving pleasure. A superimposed wishbone system is used on the front of the Alfa Romeo 4C Spider’s. The wishbones are secured directly on the monocoque and comprise a coaxial spring-shock absorber assembly, tubular control arms and anti-roll bar, all lightweight and efficient. The search for the greatest possible grip also led to the selection of different diameter tyres, 17/18-inch or 18/19-inch, larger on the back to satisfy the need for greater grip on the axle where the traction works. As it is entirely mechanical, therefore without power steering, steering with plasticised links contributes to limiting the total weight of the car and ensures a direct driving feeling for the driver. The steering ratio (16.2) is also such as to allow 90% of bends to be taken without ever taking your hands off the steering wheel. The Alfa Romeo 4C Spider offers even the most expert driver extraordinary performance and sensations: from 0 to 100 km/h in just 4.5 seconds flat, 256 km/h of top speed, deceleration peaks in the range of 1.2 g and lateral acceleration peaks over 1.1 g. All this is also achieved with a balanced weight distribution, with 40% on the front axle and 60% on the rear. The DNA selector device lets the driver change the car’s temperament to adapt it to the conditions it is subjected to at the moment. Four modes are available: Dynamic, Natural, All Weather and ‘Race’, designed to enhance the driving experience on a track even further. Race is the most extreme performance mode, and is engaged by moving the mode selector to ‘Dynamic’ position and holding it there for 5 seconds. Alfa Race mode puts you in total control of your car under race conditions. By minimising the interventions of electronic systems, it leaves you, the driver, in complete control. In this situation, ESC stability control remains inactive and only intervenes to ensure stability under harsh braking. ASR does not intervene either on the acceleration or braking, leaving the driver to control traction through the accelerator pedal alone. The 4C Spider is equipped with a specifically designed soft top which has no speed constraint and guarantees good protection and seal in all conditions. Removal of the 4C Spider roof is a simple manual procedure. The soft top can be removed by one person and can be stored in the luggage compartment in a specifically designed roof storage bag. The Alfa Romeo dealers are taking orders now.